The Bf-109E is an erly version of the Luftwaffe's main fighter. The Bf-109 can't corner as well as its rival Spitfire, but had an unmatched rate-of climb. Short range and limited ammunition were another disadvantage, but its 20mm cannon pack a wallop. Splitterbomben: Bf-109Es loaded with butterfly bombs attack a Soviet airfield. Yak-1 fighters scramble from the base to defend. Stalingrad: Romanian Air Force Bf-109Es provide close-air support, but clash with Yak-1 fightersand Il-2 Shturmovik bombers. Cauldron: While the Free French army holds the town of Bir Hakeim, South African P-40 Tomahawk fighters defend against bomb-laden Bf-109E. Neutrality: Swiss Air Force Bf-109E attack a Luftwaffe formation of Bf-110C and He-111 bombers attempting to cut across Switzerland. More fun than you can throw a control stick at! Simple game to learn and use. 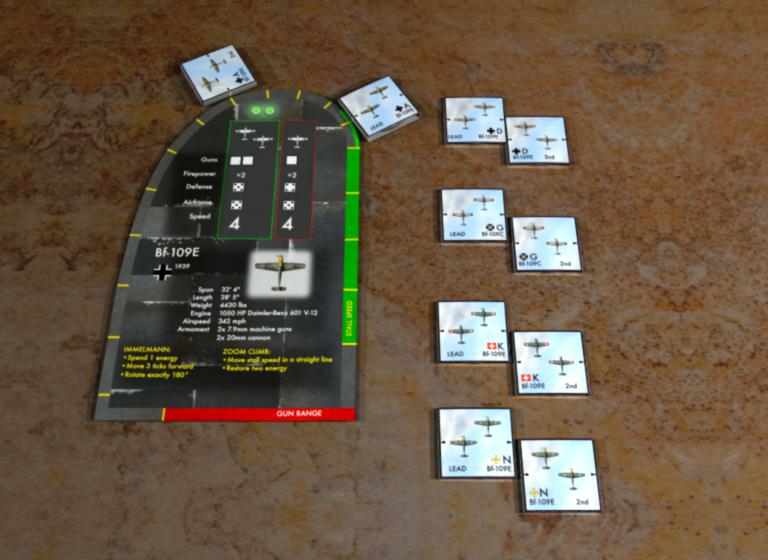 Every aircraft has its own fight performance card, which means you really have to learn the strengths and weaknesses in order to dominate the airspace. I like this simple game. It uses two-sided markers to represent aircraft and a dedicated "performance ruler" to contain everything you need to know to fly the plane. Shooting and damage are d6 dice. There's a small nod to 3d factors by allowing a plane to gain speed by burning energy that must be repaid (no effect on combat). I like that I can stick the performance ruler and a couple of planes in my shirt pocket, drop a pair of d6 in there, and I'm ready to fly anywhere. My first combats were flown on a piece of foam-core on my lap, playing both Hurricane and Bf109e. It's not Watch Your Six, Aerodrome, Wings of War, or Bag the Hun but you're in for $4 and as many planes as you're willing to print.